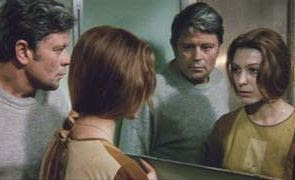 Cinema legend has it that Solaris was partly born from a healthy competition with Stanley Kubrick and a bit of Cold War competitiveness from the Soviet government and Mosfilm to trump the West. After seeing and hating the cold dehumanization of 2001: A Space Odyssey, it's been said that Tarkovsky sought to make a science fiction film about the emotions of the human condition. The result was Solaris, based on the book by Polish author Stanislaw Lem. And while 2001 was an outward expansion of the scope of our place in the universe, Solaris looks inward into the human soul and the mighty power of our ability to love. As a movie-going experience, Tarkovsky does indeed infuse his story with a heaping of brooding internalized emotions. But despite the competitive intentions, the film produces the same feeling of an existential dissertation as beguiling as Kubrick’s film. One central existential question fills the 2-hour mostly non-narrative drama. What is the moral implication of recreating another life from the dead? This is what has happened to the skeleton crew of a Russian space station orbiting Solaris, a planet seemingly without life, but one that has a distinct supernatural force emanating from its vast oceans. The first 45 minutes are spent on Earth with Kris Kelvin, a psychologist who is being coerced into investigating the phenomenon by one of the station’s former cosmonauts. Once at the station, Kelvin experiences the psychological and physical hallucinations that have caused many of the crew to go insane and even resort to suicide. Kelvin soon discovers these hallucinations are not projections of the mind but physical manifestations of one’s own subconscious. For Kelvin, it’s the mind, body and spirit of his late wife. The two other cosmonauts have already experienced this phenomenon, and while bringing back the dead seems like a miracle, everyone fears the worst. These new beings take their energy from the planet and cannot return to Earth. And even if they should die, Kelvin’s subconscious will always bring them back to life. The ethical ramifications of this scenario are known to everyone on board and so most of the film is a lengthy spiritual discussion about right and wrong. While it’s Tarkovsky at his most deliberate and languid, the discussions are intellectually stimulating, thought-provoking and wholly accessible. There’s also a strong sting of emotional pain running through the entire film, mainly the dilemma that although Kelvin has revived his wife, he ultimately cannot be with her. The film ends with a magnificent reveal reminiscent of the TV show Lost (actually, something few Losties had made connections to when that show was the water cooler topic of the day). Kelvin finds a new home using the planet's gift of life as a solution to his dilemma, a supreme sacrifice of love, tremendously powerful and profound. Solaris is considerably less ambitious technically than Kubrick’s film, but Tarkovsky still manages to craft a stunningly beautiful science fiction film. Magnificent production design and liberal but effective special effects put us into this realistic near future world. Look closely though and there’s only 3 or 4 sets used. But with clever compositions, he manages to create the appearance of a fully formed derelict space station. The scenes on Earth are just as important as those in space. There's a masterful traffic sequence early on, which initially seems like a brief transition image with the former cosmonaut Berton riding in his car through a highway. But then the sequence continues on and on for several minutes. As Burton rolls through the urban jungle, noises cascading on him and us, it becomes a surreal, abstract metaphor for the artificiality of our world and Berton’s desire to achieve transcendence like his brief time at Solaris. The Criterion Collection disc is transferred from a low con print, not the original negative. It’s a shame, as it’s not quite as pristine as it could have been. But the film looks as fantastic and sharp as it’s ever been. I could never figure out the combination of B&W sequences interspersed with colour, but it’s part of Tarkovsky’s artistic vision, which is unexplainable. Nonetheless, it just ‘feels right’. Viewers have to bare garish zoom lenses, which don’t quite fit into the visual design. But it was the’ 70s, and many great films are burdened by this ugly visual device. Solaris is available on Blu-ray from The Criterion Collection.